Webpack - A module bundler. Yarn - Package manager (npm improved, caching). Sass - CSS, with superpowers. Before we begin our project, we need to make sure we have all of the pre-requisites installed - Node.js and Yarn. We can install the latest version of Node.js from their website. Yarn can be installed on a Mac, via the command line, using Homebrew. If you don't have Homebrew installed on your machine, you can install it using the command given on their home page. Yarn is a fast and reliable package manager, that can be used in much the same ways as npm. The benefits of using Yarn here is that it caches every package that is installed, so reinstallations are much faster. It also offers more great features such as offline mode and guaranteed reliability across systems. Let's begin by creating a new directory and initializing a project inside that directory using Yarn. Running yarn init will initialize a new project, much like running npm init, and ask for some default app configurations to be included in the package.json. We can use the yarn add command to install these packages. Yarn will then auto-generate a new lockfile - called yarn.lock - that stores the exact versions of your dependencies, much like npm-shrinkwrap.json, although Yarn's lockfile is not lossy and will allow previously installed versions to install much faster. Once Webpack has been installed, we can create a webpack.config.js file to specify the configurations needed to bundle our app. In this file, we need to define an entry point and an output for our files. The entry point is where the bundling process will start and should be the file where we will eventually render all of our React components. In order for our React application - written with ES6 and JSX code - to run and work in the browser, we will need to compile our code into a format that the browser can understand. For this, we will use Babel. Again, we will install these packages with Yarn. We also need to create a .babelrc file in the root of our application's directory to specify which Babel presets we are using. The --dev flag is included in this script to add the packages to our devDependencies, as they are only required during development of the app. Once these packages have been installed, we can add our preset specifications to the new .babelrc file. In our case, we are using the babel-loader to transform our ES6 syntax and React code, although there are many other loaders available, which you can check out via the Webpack documentation. To allow us to serve our bundled file, we need to specify the html-webpack-plugin to inject the bundle into the body of the HTML. Again, install this plugin with Yarn. We, now, need to go back into our webpack.config.js file to create a new html-webpack-plugin object and set the name of the HTML file we want to inject our bundle into and where we are going to inject this. Now, our development environment is ready, but we don't currently have anything to serve. We can create an index.html and an index.js file inside of an app directory to get started. $ touch index.html index.js && cd .. In our index.html file, we want to structure out a base HTML skeleton and in the index.js we can simply output a message to the console to verify that our setup is working. Finally, to serve our application, we can add a start script to the package.json and run yarn start. Now, head over to localhost:8080 and open up the developer tools to check that the application has rendered correctly, and our message is logged to the console. We can also check the Network tab to see that the bundled files have been rendered at the request URL of http://localhost:8080/bundle.js. 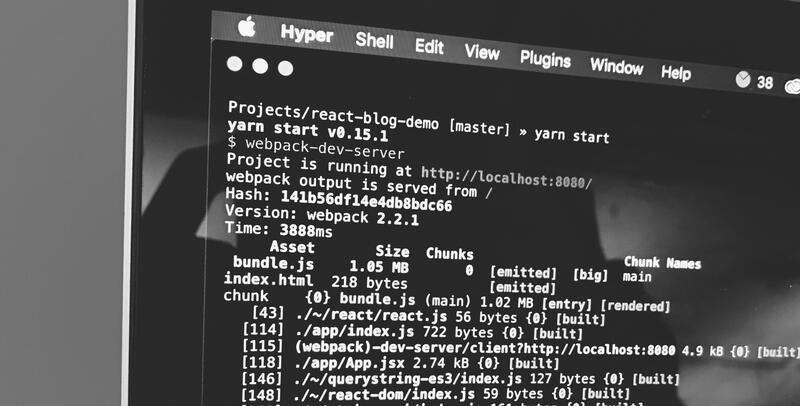 Once more, we need to install React and a package called ReactDOM using Yarn. The react-dom package provides DOM-specific methods, such as render(), on top of the core React functionality. Now we will create a folder inside of the app directory called components, where we will write all of the JSX components that we will render into our React application. Let's also create a React component called WelcomeMessage.jsx. So, let's start writing our React components. For this demo, we will write a simple component that displays a welcome message to the page. We will create more complex components in the coming posts, but for now, let's keep things simple. A React component must include a render() function so that React knows what the output of this component is. Here, we are simply returning a header that displays a welcome message, with a title passed in using something called props. This data will be passed down from the parent - here being the index.js file - which could be another component. Here, we have created our main index file where we will import the ReactDOM class to render our components to the DOM. We have created an object called appData where we have set a title and have passed this to the rendered component using the single curly-brace syntax. Now, Webpack should have recompiled our code so we can go back to localhost:8080, reload the page and see our component has been rendered. You can also check out all of the rendered components using the React Developer Tools extension for Chrome. This is a pretty cool way of keeping track of component state and what data is being rendered to which components. We now have a working React development environment, using JSX components. We could extend this environment further by adding some new loaders to our Webpack configuration to allow us to compile Sass code to improve our applications styling. Sass is a CSS preprocessor that adds a lot of powerful functionality to our stylesheets including variables, nesting and mixins. Let's install the necessary Webpack loaders with yarn, as well as node-sass which is required by the sass-loader as a peer dependency. Again, we need to add a loader to our webpack.config.js loaders object. Here, you can specify which syntax version of Sass you would like to use (scss or standard sass), with scss being my preference and is set in the example. Now, we can create an app.scss file inside of our app directory to start writing some Sass. The final step to allow our compiled Sass to appear in our application is to import it to the entry file of our React app, alongside our components. As you can see, creating a modern React environment can require a lot of configurations, and it's easy to get lost in the wide array of tools available. Hopefully, this blog posts sheds some enlightenment on how to build a powerful, yet simple, environment fast, to allow more time to be spent building complex React components. The next couple of blog posts in this series will focus more on React, and how to create a fairly complex application that acts as a blog. The blog will allow users to read, create, update and delete blog posts on the system by utilising React conventions, such as dynamic props, handling data changes with component state and synthetic events.